Hardwood floors are a classic design choice with several practical benefits, but despite the aesthetic appeal, wood flooring is incredibly vulnerable to water damage. Leaky roofs, busted pipes, overflowed toilets, and other sources of sudden floods can turn gorgeous wood planking into a warped, mold-prone mess in just days. Drying hardwood floors properly is more important than you think, and there’s more to repairing water damaged floors than laying out a few towels and a fan…dry-looking wood can still buckle later. 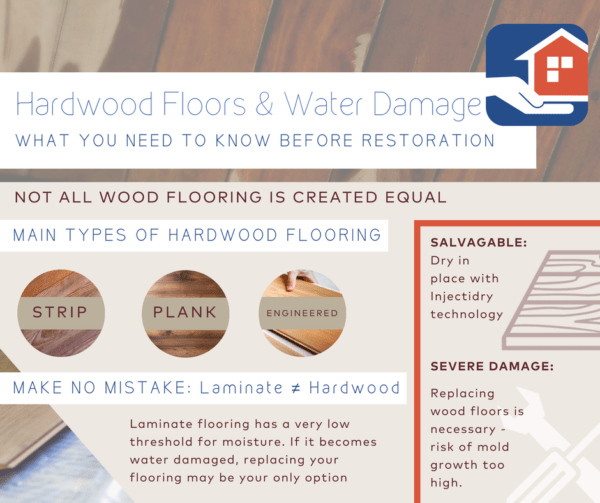 Following these steps immediately after experiencing water damage will help ensure your hardwood floors dry properly and maintain their look and functionality. It’s important to thoroughly dry your hardwood floor as soon as possible following a water emergency. Even waxed and sealed floors can absorb water into the grain of the wood if the flooding is excessive enough. Once the cupping process is underway, which is when the sides of the floorboards swell and rise higher than the center, there’s only one thing left to do: rip out the flood-damaged floor and replace it. To ensure a proper job of drying your hardwood floors and minimizing the damage, the best thing you can do is call a certified expert. Even when you think you’ve done a good job of it, being wrong could end up costing you a lot more than you tried to save by doing it yourself. Additionally, every minute it takes you to figure out the process and secure the necessary equipment to do the job on your own increases the risk of irreparable damage to your floors. The only way to effectively tackle a wet wood floor is clear it completely of furniture and rugs. If they are wet too, set them outside in the sun to dry. But, of course, if the flooding is caused by continuing rain, set the items in a dry area with durable flooring, such as a garage. The next step to drying hardwood is to remove as much of the visible water as possible from the floor with a wet/dry vacuum, which is neither a regular household vacuum nor a steam-cleaning vacuum, but a specialized version available at home repair stores and auto parts retailers. At wet/dry vacuum will suction up standing water, but don’t stop once the floor appears to be dry. Continue vacuuming the surface in order to remove water from invisible pores in the wood that can cause water damage later. After removing all excess water, you’ll need to scrub the hardwood floor surface with a non-sudsy disinfectant, which will ensure there’s no leftover dirt or debris that could store water in those invisible pores. After a thorough cleaning, use the wet/dry vacuum again to remove any remaining water. Blame the pores again. Moisture can still linger deep within the water damaged wood, so you’ll need to crank up a dehumidifier to full power in the center of the room and leave it running for at least a full 24 hours. If you don’t have a professional-grade dehumidifier on hand, some home repair stores offer equipment to rent. Take note: small, personal-use dehumidifiers won’t be up to the task. While dehumidifying, set up several large fans in the room to run on full blast—air flow will help the dehumidifier work more efficiently. Point the fans toward the floor, and if you have air conditioning, run that as well. The excess moisture has to go somewhere, however, so open windows in the room about two inches. According to the EPA, mold is capable of growing on most materials with a moisture level of 16% or higher in as little as 48-72 hours. “Normal” wood floor moisture varies from 6-12%, which means it doesn’t take much “missed” moisture to do some serious damage. Mildew isn’t as much of a health risk as mold, but it can still damage wood from the inside out. If you see any suspicious spots, immediately scrub the entire floor. This can be done with a simple mixture of baking soda and water. Yes, even after all that vacuuming, scrubbing, dehumidifying, and fan-blasting, there could still be dastardly specks of moisture hidden within the wood. The only way to be sure that every trace is gone is to use a moisture testing meter. And if it tests positive, you’ll need to leave the dehumidifier running until the meter gives you the all-clear. 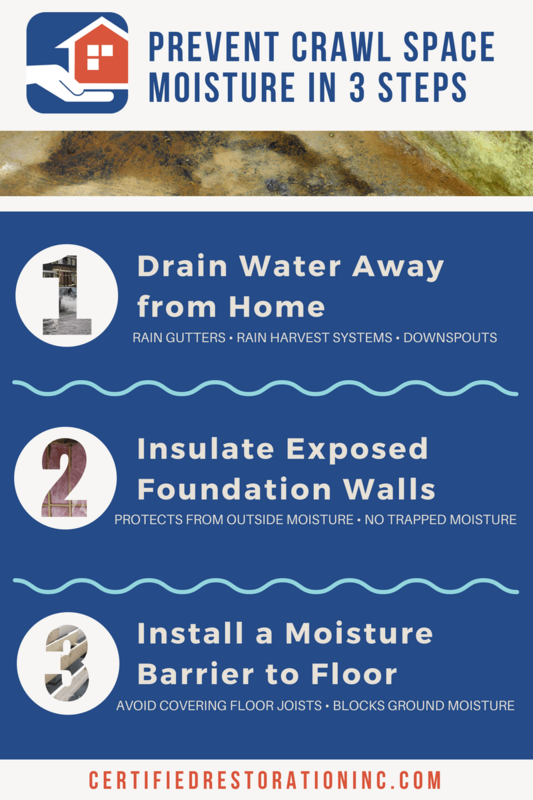 As you can see from steps 1-7, removing all the water and moisture from your flooded hardwood flooring takes an enormous amount of time and effort. And the DIY approach isn’t even cost-effective when you factor in all the equipment you’ll need to buy or rent. Plus, as a non-professional, there’s always the chance your “pretty good job” isn’t good enough. In the end, you will have to replace the flooring anyhow. Don’t waste your time and money! Call a water damage restoration expert as soon as you notice the flooding. Professional floor drying is much less expensive than replacing wood flooring, and you get the added benefit of peace of mind that the job is done right. Need us? We’re on our way! At Certified Restoration, we’ve been restoring water damaged wood flooring in San Diego for over 20 years. We take immediate action to minimize the damage to your wood floors. It’s our policy to be on-premises within an hour of your call, and we have 24/7 emergency response available. No job is too big or too small, so give us a call.